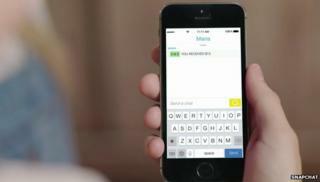 Snapchat has unveiled a new feature that will allow users to send money to other clients of the messaging app. Snapcash is a partnership with payment-processing firm Square, which offers its own stand-alone friend-to-friend payment app called Square Cash. The service will only be available to Snapchat users in the United States who are over 18 years old. None of a user's personal financial information will be stored on Snapchat's servers. Almost immediately, the news of the money-sending feature was met with some raised eyebrows, as Snapchat has struggled with several high profile security breaches. In May, Snapchat settled with the US Federal Trade Commission (FTC) over allegations that it misled users over data collection and failed to inform them that their messages could be saved. The company agreed to be monitored by the FTC for 20 years. And earlier in the year, in January, at least 4.6m user accounts were compromised by hackers, who posted usernames and phone numbers on the web. Snapchat was keen to allay concerns over security. Users who sign up for the service will be creating a Square Cash account. "We set out to make payments faster and more fun, but we also know that security is essential when you're dealing with money," wrote Snapchat in a blog post announcing the feature. "Square has a ton of experience in this area and our teams have been hard at work to make Snapcash a great experience for everyone." Founded in 2011 by the then 23-year-old Evan Spiegel, Snapchat currently has around 100 million monthly active users. Snapchat is a messaging app that allows the sharing of videos and images that "disappear" after a short period of time, usually just a few seconds. To use Snapcash, a user enters their banking information into Square Cash's servers. Then, to send a payment, a Snapchat user types in the dollar amount that they'd like to send in a private message. The app then recognizes the dollar amount - $10 say - and a green payments button appears, which a user would tap to complete the payment. The payment system is similar to other mobile payment services, such as Venmo and PayPal. It is part of Snapchat's broader push to expand beyond its core messaging business by both adding advertising and branching out into live events.